A very good reproduction! 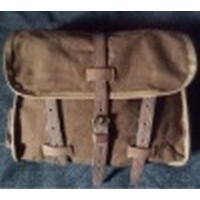 Matches up to my original M1936 suspenders very nice. Slight differences in some of the hardware, but then the originals were made by many manufactures, and the color looks the same shade as my faded ones With the extra length of the straps, it fits my 6'4" frame with room to spare. All but two buckles are plated black and appear very wear resistant. Material matches their M1936 pistol belt very well too. Use with their felt pads for a unique look and a comfortable feel.